Sitting right now in the Midwest Airlines departure lounge in Kansas City, waiting for our flight back to San Francisco. A quick recap of the final few days in KC, most of which were spent sampling local delicacies and enjoying the company of friends and family. Right: Emily and Chris go out for fried chicken. 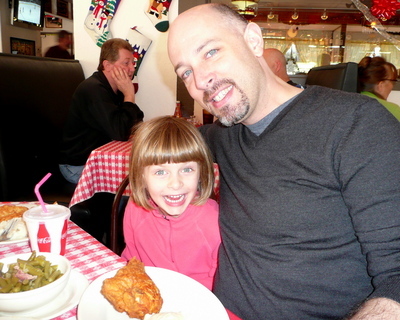 Monday afternoon we took my niece to lunch with my grandparents at Stroud’s, the “home of Pan Fried Chicken”. They claim to be the only restaurant in KC that pan fries chicken. Whether that is true or not, I don’t know. But they sure turn out some tasty home style cooking. 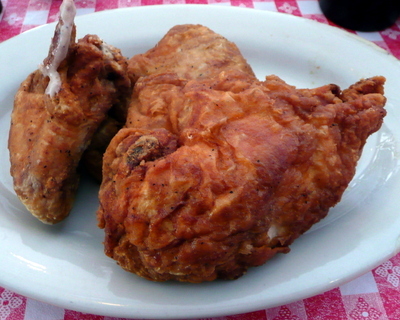 Above: three pieces of Stroud’s crispy pan fried chicken. The verdict: Stroud’s makes tasty fried chicken, very crisp. The meat itself, though, doesn’t have a lot of flavor. The side dishes, especially the heavenly mashed potatoes, are great. And their slogan (“We choke our own chickens”) is priceless. Later in the day I scanned a lot of old photos from my grandparents’ photo albums. 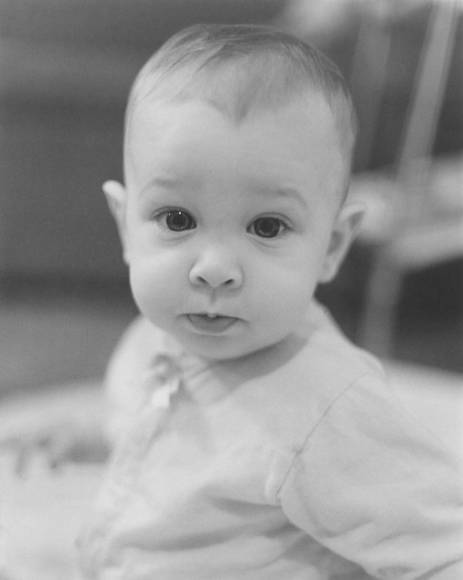 I’ll share more of these in the coming weeks, but here’s one from when I was just about six months old. My uncle, who is a photographer, took the picture. Monday evening we stopped by the Honorary Royal Thai Consulate. Yes, there is a Thai consulate here in the greater Kansas City area. I applied for another one-year business visa, something I will have to do every year for the foreseeable future. A year ago when I applied, the Consul General, who is an American woman, didn’t spend a lot of time talking with me. This time, however, I brought Tawn along and we ended up spending a half-hour at her house (the family room of which is the consulate), talking about Thai politics, etc. She told us that she thinks we should have children and went on about her frustration that proposition 8 passed in California. Kind of unusual, huh? We ate at Houston’s, a small chain operated by the Hillstone restaurant group. 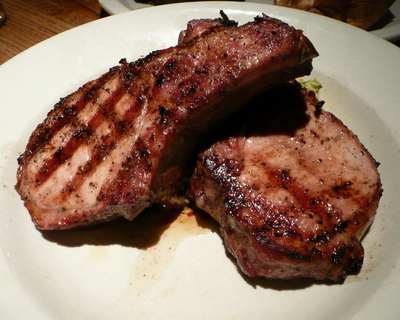 For a chain restaurant, they have a good wine list and excellent pork ribs. 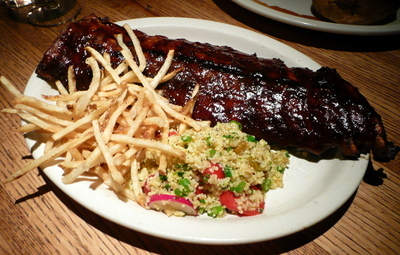 Knife and fork tender, which is how I like them because I don’t like to gnaw on rib bones. 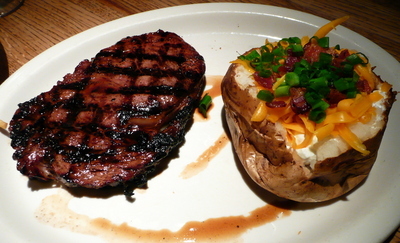 From the top down: Ribs with cous cous and fries, Hawaiian rib eye steak with baked potato, double-cut pork chop. There’s a little more to share but I’ll have to do it from SF as we’re about to board. Have a happy and safe new year’s eve! Technology is not entirely a foreign thing for our family. 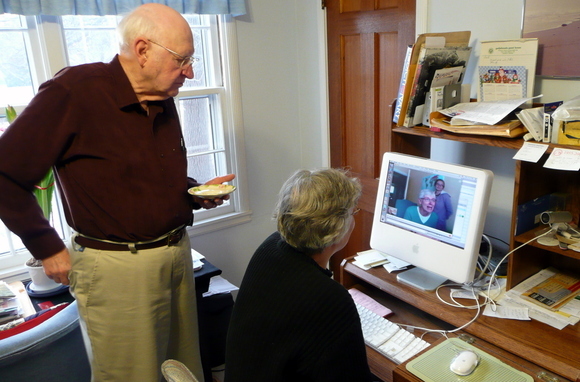 On Christmas Day my grandfather fired up Skype and we had a video chat with my aunt and uncle and cousins in Seattle. They were nearly snowed in and turned the camera out the study window so we could see the several feet of snow covering their yard, sidewalks and streets. Was that really Seattle!? That would be much more likely here in the midwest. Friday morning we had family portraits down at the photo studio. I think it takes a person with a very special personality to be a good family portrait photographer. Not only a good photographer but patient, funny, and a child psychologist. 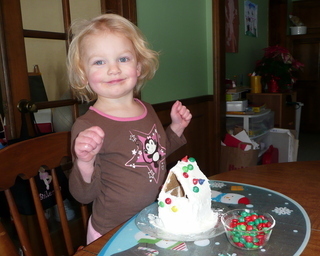 After the photo shoot, Tawn and I took Emily off her parents’ hands for a special afternoon with her uncles. First off we headed to the Plaza, a nice shopping area down near the country club. 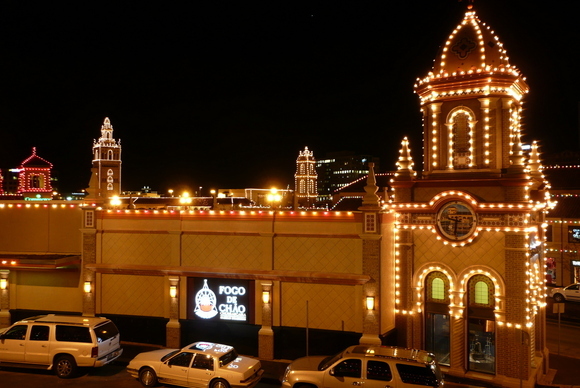 This is the oldest shopping district in town and is still a very nice place to visit. 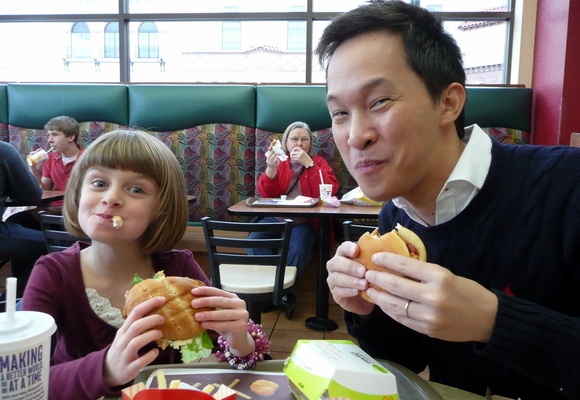 Emily chose our dining venue for lunch: McDonalds. Sadly, after several years of avoiding McD’s, I wound up eating there. 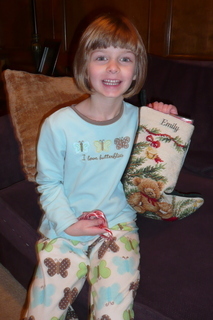 In the afternoon, we went to the book store to spend a gift certificate Emily and her sister received for Christmas. At first, Emily tried to sell me the story that the gift certificate was only for her, but my sister clarified and so I insisted that Emily choose a book for her sister, too. We stopped by the Gap and found a nice top for her on sale, something light enough that it can be worn into the summer. Finally, we waited for uncle Tawn at Starbucks while he went shopping at a few other shops. It took him a long time to return and after reading through all the new books together, Emily started to get a little impatient. Saturday morning Tawn and I drove to Overland Park to meet one of the owners of the Gasper Family Farm. They have a small, diversified family farm that runs in a sustainable manner and offers only 100% grass-fed, pastured cows, pigs, and dairy. The more I’ve been reading about food safety and sustainability issues (Michael Pollan, The Omnivore’s Dilemma) the more I want to better understand what is actually available as far as sustainable, locally-produced food. A few months ago I signed up for the Gasper Family Farm’s e-newsletter and decided that when I was back in KC I would buy some of their produces. I emailed Susan, the “mom” of the farm, and placed an order for ten pounds of beef (combination of steaks, a roast and ground beef) and five pounds each of ground sage sausage and ground cayenne pepper sausage. When I arrived at the designated pick-up point, one of her customer’s driveways on the corner of 80th Street and Hemlock, on a drizzly, freezing cold Saturday morning, Tawn thought it looked rather like a drug buy. Sure enough, she pulled the frozen goods out of a cooler in the back of her Chevy Suburban, cash changed hands, and I bought a dozen freshly-laid eggs, too. 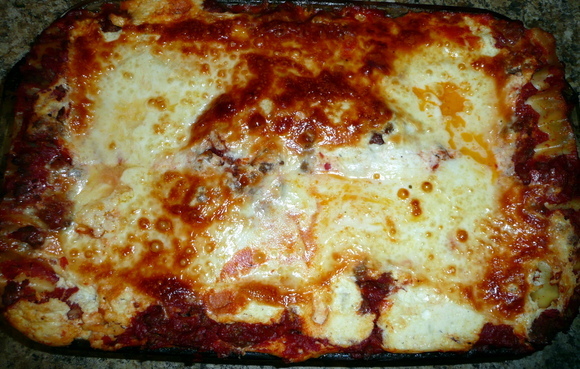 Back at home, I decided to put some of my sustainably made food to the test, baking a lasagna for dinner. Mixing a pound of the beef with a pound of the cayenne pepper sausage, I had a nice bubbly lasagna ready a few hours later. It was lovely. I still want to try the eggs, comparing the pastured eggs with the conventional ones my sister bought at the store. I noticed that with the two eggs I used in the lasagna, the yolks looked much more vibrant than with conventional eggs. 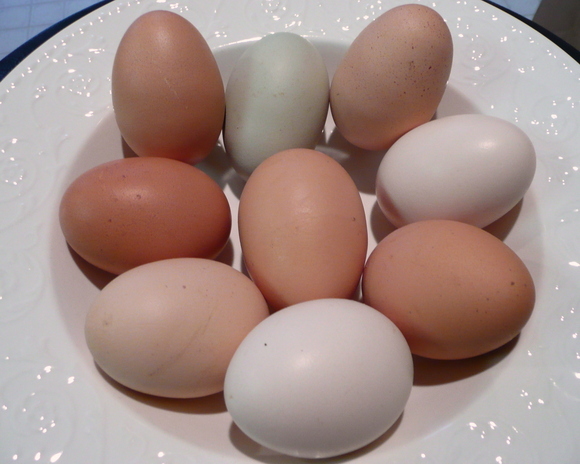 Speaking of sustainable eggs, I was tickled to see that the eggs came out a rainbow of colors from pale pink to greenish-brown to beige to brown. Emily and Ava thought this was pretty cool. 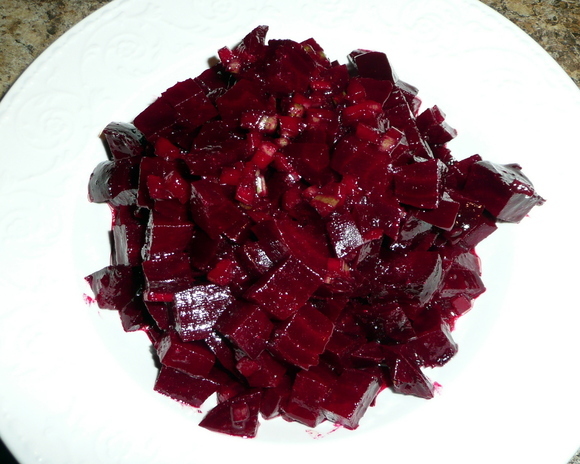 To accompany the lasagna, I did a roasted beet salad with a honey dijon vinaigrette. In other news, here’s the video of our sledding last Wednesday. With all the crazy weather we’ve had here, the snow was entirely gone by the day after Christmas and then a little bit of it was back by this morning. So we threw on some clothes and headed upstairs. Sure enough, Santa had paid us a visit overnight! The snacks and eggnog that had been left by the fireplace had disappeared. All that was left were a few crumbs. Santa must have been hungry. 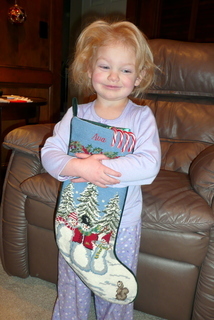 First things first, we checked our stockings, which had been hung by the fireplace with care. There were all sorts of little goodies inside. Thankfully, no one received any lumps of coal, so we must have all been good this year. Then I prepared breakfast: homemade biscuits with sausage and gravy. Very nice start to a holiday, if you ask me. 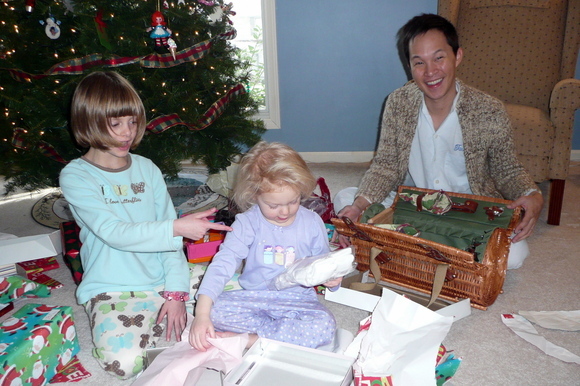 After breakfast we went to the family room to unwrap the gifts that Santa had brought. Amazingly enough, Santa had heard that Tawn was celebrating the holiday in Kansas City and had brought his present here: a picnic basket and set, complete with plates, glasses, corkscrew, cutting board, knife, etc. Above: Emily and Ava don’t even look as Tawn shows off his new picnic basket. In the afternoon we headed to my grandparents’ house for dinner. 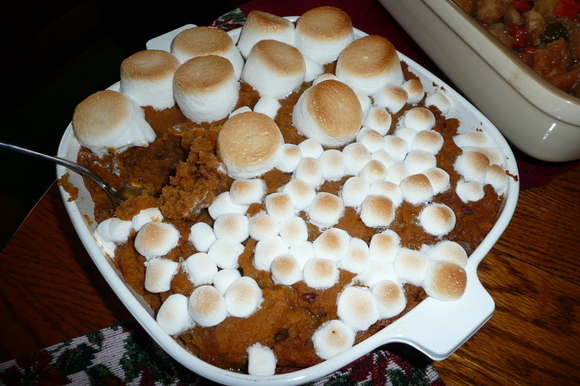 It was a tasty dinner but what I really want to share is this picture from the candied yams. My grandmother ran out of small marshmallows halfway through completing the dish, so she had to switch to large marshmallows. I thought it was kind of funny. 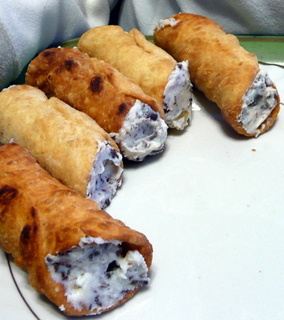 Later, she served us a special dessert that she hasn’t made for years: homemade cannoli. This Sicilian dessert is a pastry shell filled with a mixture of sweetened ricotta cheese and chocolate shavings and candied citrus peel. Very rich. She’s quite a cook and this was a really nice treat. 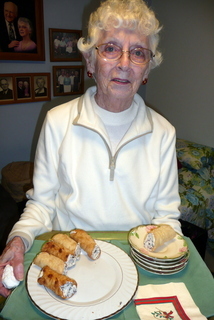 Below, my grandmother and a close-up of the cannoli. My grandmother is very talented. 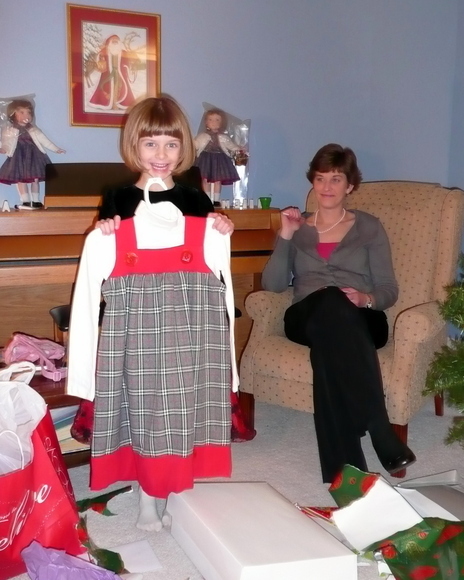 Below is a picture of my niece Emily’s Christmas gift from her: a dress that my grandmother made. 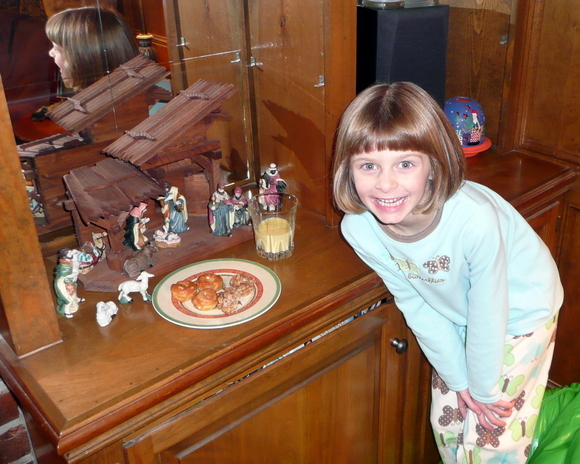 On the piano in the background are two dolls that my grandmother made, too. Not only did she make the dolls, she made the costumes for them. She’s made dozens of these dolls over the years. Very talented lineage I come from, eh? In the evening after we returned home (I have a hard time getting used to this midwestern schedule, eating dinner at 5:30!) 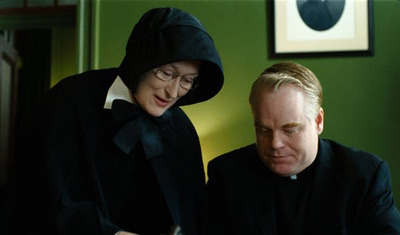 we were nowhere near ready to go to bed, so Tawn and I went to watch the new John Patrick Shanley film, “Doubt”. A brilliant screenplay and no doubt an amazing stage production. However, I don’t think that it translated so well to the big screen. The film felt very claustrophobic and I was so relieved in the one scene where Meryl Streep’s character and another character go for a walk outdoors. Still worth watching but maybe only a three out of four stars. All in all, a relaxing Christmas. When people get married, they have to find a way to handle holidays with their two respective families. Do they try to combine into a single, large celebration? Or do they find a way to juggle the two families’ celebrations? In the case of my sister and brother-in-law, they have opted for the latter approach. Holidays are alternated. 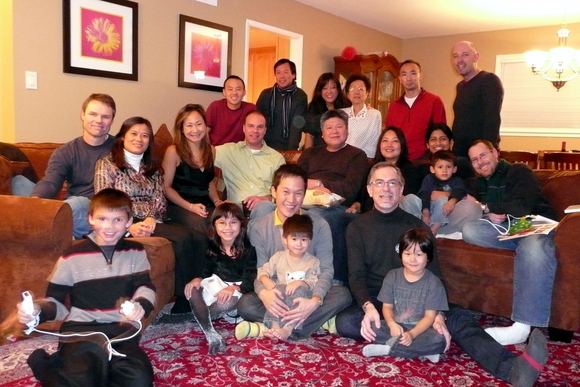 Thanksgiving was with my side of the family this year and Christmas Day will be with my brother-in-law’s family. Because of that arrangement, we had our official Christmas Dinner on Christmas Eve. We will do another Christmas Dinner, a more casual one, at my grandmother’s house on Thursday. Before I tell you about dinner, though, we were met at the airport Tuesday evening by my sister, two nieces and mother, left. It was dark already and very cold, but they braved the thirty-minute drive to the airport to be there as we walked off the plane. What a nice way to be welcomed to the chilly midwest! For dessert, “The Next Best Thing to Robert Redford”, a refrigerated dessert that combines the best of chocolate pudding, whipped cream, and cream cheese. It was a pretty easy menu, which left time during the day for all sorts of fun. First off, it snowed about an inch last night. Not a significant amount, but enough to go outside and do a little sledding. 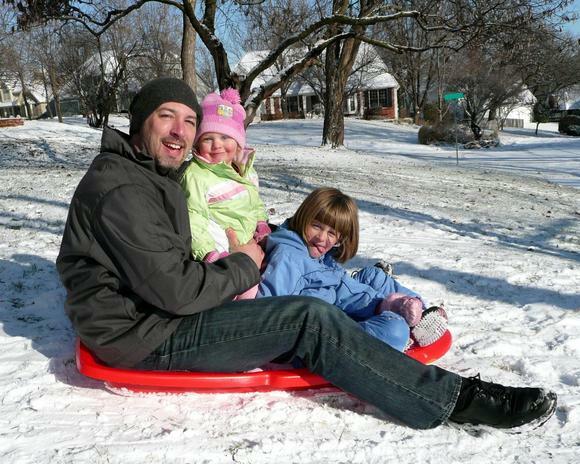 Above: Me, Ava and Emily in the front yard. I have some fun video from that but no time tonight to edit it. Look for it in a future posting. From top left, clockwise: the lamb, pork, sourdough bread, mashed potatoes, carrots and Brussels sprouts. 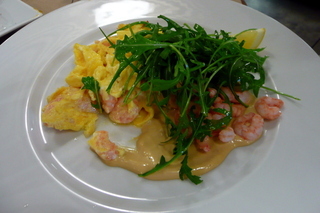 The dinner turned out very tasty, a nice simple meal. The lamb is a different breed than the one sold most commonly. 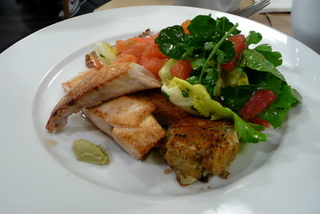 It has a tamer taste and was very enjoyable. The pork was really moist. The Brussels sprouts were my favorite. I think taking the time to core them and pull the leaves apart really makes a big difference, making them sweeter. Usually, when they are served whole, I find them a little bitter. It is a bit of extra work, but worth it. Sadly, I have no pictures of the Next Best Thing to Robert Redford. My apologies. But it was tasty. After dinner, we headed to church for Christmas Eve service. It was at a United Methodist church, the one my grandparents and sister and brother-in-law attend, the same one my parents were married at, the same one where I was baptized. One observation, though: is it just me, or are protestant churches especially gifted at making upbeat hymns celebrating joyous occasions such as the birth of their savior, sound mournful? First off, to those Christian members of my audience, Merry Christmas to you and yours. 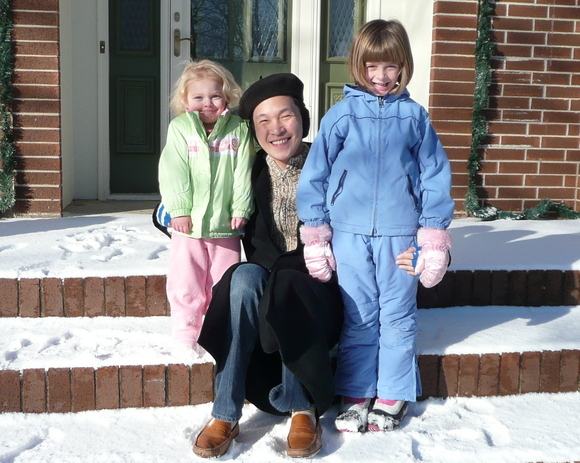 It is actually just a few minutes before midnight on Christmas Eve here in Kansas City, but since my Xanga account is set for Bangkok Standard Time, it shows that it is already Christmas Day. Second, many thanks to all of you who expressed concern for Tawn’s battle with his jet lag. I’m glad to say that he’s much better now than he was. Your kind thoughts no doubt helped speed his recovery. We used much of Monday for Tawn’s recovery. Sadly, this meant that we had to cancel some of our plans. We felt very bad about that, but ultimately on a trip like this one, health has to be the first consideration. The entire trip could wash out if one or both of us became seriously ill.
By Monday evening Tawn was feeling well enough for us to keep our dinner appointment with my aunt, uncle and cousins. Of course, family is a priority in our life and so we made the trek over to the east bay for a very enjoyable dinner. Before leaving, we had breakfast at Squat and Gobble, a small chain of creperies. Thanks to Jordan for letting us know that they actually open for breakfast. I had always thought that the location, which is just a block or two away from Anita’s, was just open for lunch and dinner. We had another nice American style breakfast, something that just is never the same in Khrungthep. 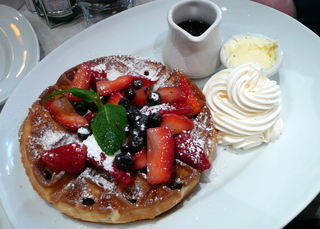 Left, buttermilk waffle with berries and maple syrup. 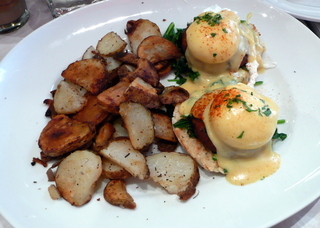 Right, poached eggs and hollandaise sauce on English muffins, with home fries. We headed to SFO for our noon flight on Midwest Airlines, the only airline that offers a nonstop flight from SFO to Kansas City. The airline, which like many of its peers has suffered some tough times, is still a favorite of mine. They offer a “premium economy” product, friendly service, and good value for the money. I’m the kind of traveler who will spend a little bit extra for greater comfort and convenience. My days of suffering in a cramped middle seat in the far back of a sardine can are over. 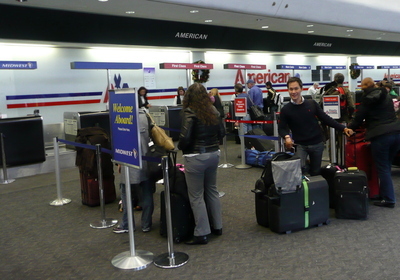 We managed to arrive just a few minutes before the check-in counter (which is handled by American) opened. Once the counter opened, the agent informed us that because of weather in the midwest, the inbound flight was about forty minutes delayed. Thankfully, this report was accurate and the delayed departure time didn’t slip at all. This delay gave us time to enjoy SFO’s good selection of food – at least the good selection that is in the North Terminal. 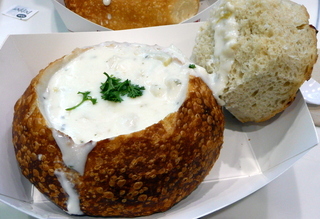 Of course, no trip to San Francisco is complete without some clam chowder, so we stopped at Boudin’s for a bowl of soup served in a hollowed-out sourdough round. Too much bread, to be honest. Tasty, but an insane amount of bread. 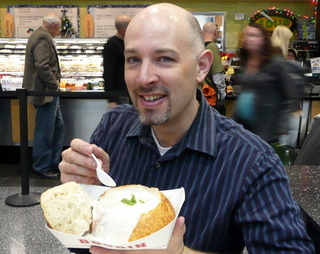 The chowder was pretty good, though. 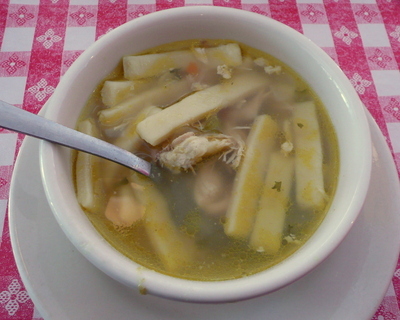 Frankly, I think the best chowder is served from the large vats at Fisherman’s Wharf late in the evening when there is just a little bit left and it has been simmering all day long. So tasty then. But this was a reasonable substitute. Before leaving San Francisco, I’ll share a Christmas sight that I saw while walking in the Castro. 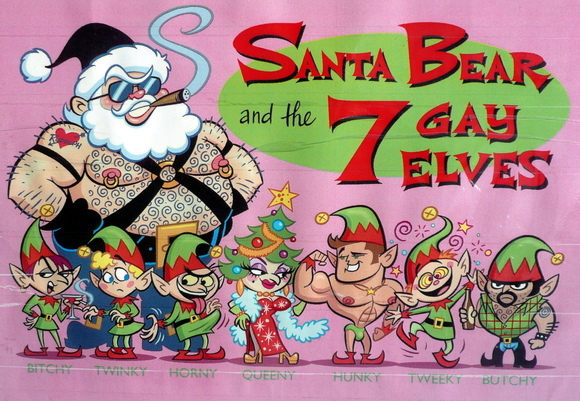 Yes, a merry gay Christmas to you, too. It is amazing how jet lag affects people differently. On my first night here I took a sleeping pill, slept fairly well through the night, and have largely been able to function on a normal schedule ever since. Sure, I’ve woken up a few times in the night and have had to wait twenty or thirty minutes to fall back asleep, but other than that I’ve had no ill effects. Tawn, on the other hand, has had a hard time adjusting – both to the new time zone as well as the hectic schedule-a-go-go that we’ve been running. By Sunday afternoon he was starting to hit some rough patches and my Monday morning, he was dragging. We called off several appointments on Monday and he used the time to rest. The symptoms, which seemed almost like a cold, abated enough by late afternoon that we were able to get over to my aunt and uncle’s for dinner. Hopefully, he’ll be fully back to speed soon because we travel to Kansas City on Tuesday. 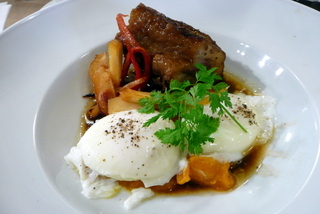 Saturday morning we went to the Ferry Building for brunch at Boulette’s Larder, one of my favorite places to eat. Truth be told, the food (which was very high quality) didn’t wow me as much as previously, although the Christmas Spice beignets were spectacular. Good ambience and company, though, as we were joined by Stuart, who was in from Bangkok, and his local friend Rupert. Not sure why I managed to crop the beignets differently from the rest of the food pictures… But from upper left clockwise: Christmas Spice beignets, poaches eggs on polenta with braised beef, seafood platter with smoked salmon, grilled tuna and crab cakes, and sweet Maine shrimp scramble with arugula. Grow your own oyster mushrooms. 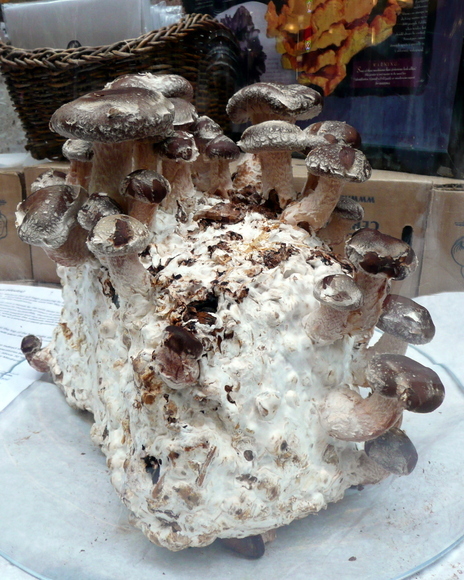 A sawdust block impregnated with the fungus that produces oyster mushrooms. Will grow several pounds of mushrooms over a few weeks if properly maintained. The gift that you can’t live without! 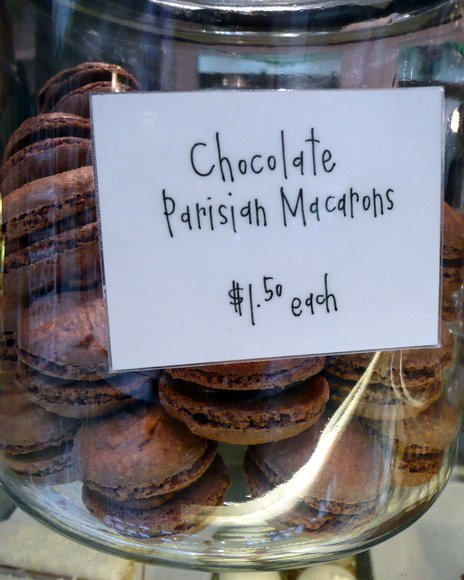 A bakery – the first I’ve seen – that makes French macarons without food coloring! Yes, the lemon ones (not pictured) look like most of the other flavors and chocolate is the only flavor you can identify by sight, but I really like that they aren’t so artificially colored. 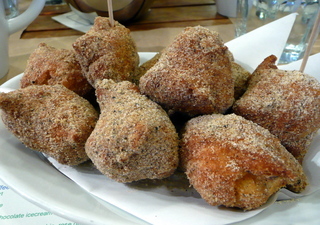 Plus, they use a coarser almond flour that really gives the confections a chewier texture. Heading back to the Embarcadero, we received a message from Anita that most of the high school gang was gathering for dim sum at Rincon Center. This was only two blocks away so we stopped by but didn’t eat anything. 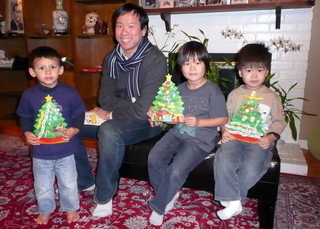 Since our plates were empty, our “nephews” – Devin, Maximo and Joaquin – decided we would be fun to play with. 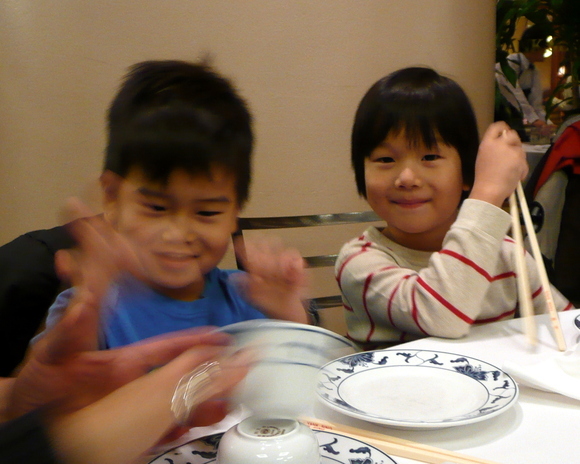 Below, Maximo smiles sweetly while his brother manages to almost tip over two tea cups. Above, Uncle Tawn with Joaquin, Devin and “Ultra Man” Maximo at Rincon Center. After a few hours of visiting, we returned home and Tawn was ready for a much-needed nap. Lalima had thoughtfully arranged tickets for the San Francisco Ballet’s production of The Nutcracker. The definitive North American production (SF Ballet introduced it to the continent in 1944), it was magical and a perfect holiday treat. Saturday morning we were up early and back at Tartine shortly after they opened. No significant line and we were able to find a table inside. 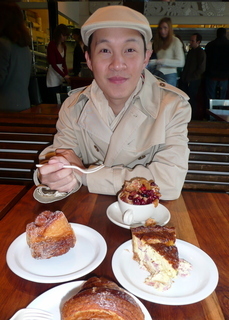 Sure, Tawn was freezing on the way over but once we arrived and he tried their amazing baked goods, he was in heaven. Left, Tawn sampling a variety of Tartine’s goods: brioche bread pudding with cranberries and apples, morning bun, ham and herb quiche, and croissant. After eating our fill and enjoying some lattes, we walked across 18th street to Dolores Park. The sun was now out, making the weather much more pleasant, and we climbed up the hill to take in the sweeping view of the city. 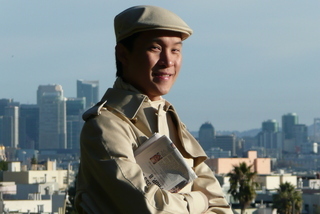 San Francisco is a city defined by its views and its food, both of which are impressive. 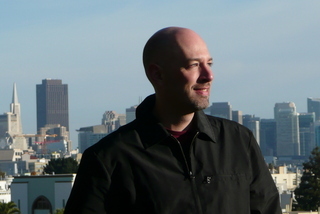 Here, Tawn and I posed for some portraits with the south of Market Street area in the background. 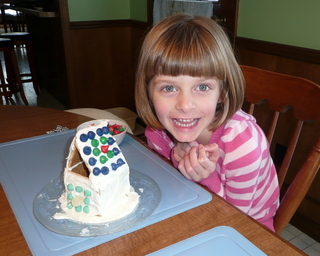 We visited with Brad and Anne Marie, her parents, and of course their two talented daughters. Brad grilled some fantastic tuna steaks. Whoops – we were calling it “chicken” since the girls ostensibly don’t like fish. Funny how much they enjoyed their grilled “chicken”. In the afternoon, we headed back over to the Castro district and took a walk around before heading back to Anita’s. 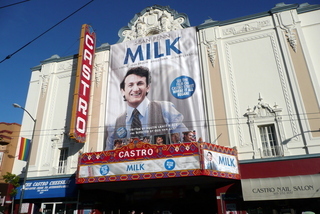 The Harvey Milk biopic, “Milk”, is showing at the Castro Theatre for one final week before the sing-along “Sound of Music” returns. We would like to catch the film but I think it will end up showing in Khrungthep, so maybe there isn’t such a rush. But the opportunity to see this film in the classic Castro Theatre, with its mighty Wurlitzer organ and the ambience of being located in the district where Harvey Milk rose to fame, seems like an opportunity that is a shame to miss. Late afternoon, Paul drove us down to the South Bay for the holiday get-together of my high school friends. After a brief stop at Restoration Hardware to look at table lamps, we arrived at Lilian’s mother’s house in Sunnyvale. I haven’t been there in at least a decade and was impressed that I remembered the way. 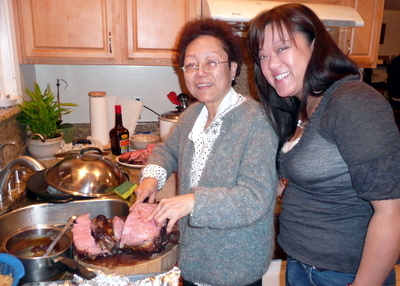 Two years ago, Lilian and her mother (below) were in Thailand at the same time my parents were, aunt and uncles were. The whole group of us – some dozen in all – went down to the school where I was volunteering. We spent the first half of the day doing activities with the students, then the community made a huge lunch for us and took us on a tour of the province by canal boat. Full story here. Lily’s mother has been looking for a way to thank us for that unique experience, so when she heard we were going to be in town, she told Lilian to invite everyone over for dinner. So Lily’s mother made a HUGE dinner for us. I only managed to get a few of the pictures, but we had prime rib of beef, noodles with chicken and greens, double-fried green beans, sea bass steamed with soy sauce and green onions, bok choy with oyster sauce, steamed salmon, fried rice, spaghetti with homemade sauce, and pot stickers. Brad brought a great green salad, Paul made an artichoke dip, and we had some other things, too. What a meal! Everyone was there. 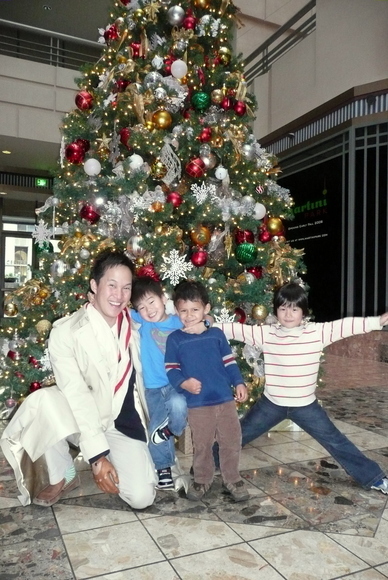 For the first time, I was able to meet Samantha and Jimmy’s nephews, Maximo and Joaquin. I’ve seen their pictures for years but had never actually met them. So cute! Plus, Lalima and Aaron were able to join us from LA with their son Devin, and of course Brad and Donna’s children were there, too. 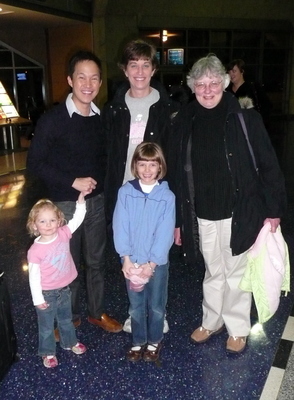 Left to right, standing: Paul, Darren, Lily, her mother, John, and me. Seated on the sofa: Brad, Donna, Anita, Eric, Jimmy, Samantha, Lalima, Devin, and Aaron. Seated on the floor: Evan, Cara, Tawn (with Joaquin in his lap), Albert and Maximo. 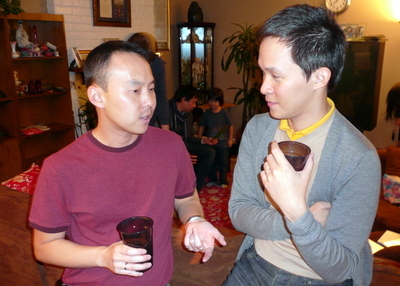 Paul and Tawn chat in the living room. 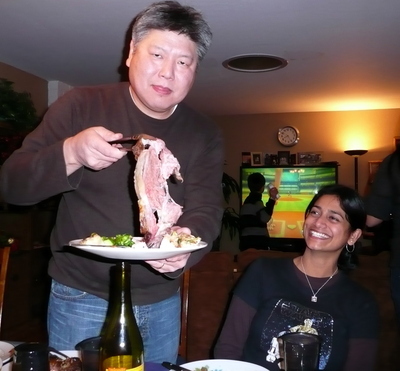 Jimmy manages to make prime rib look very disgusting as Lalima looks on. 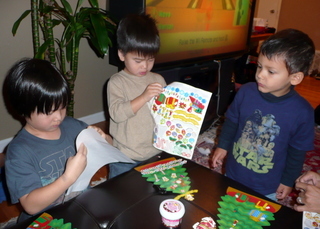 The boys work on decorating their Christmas Trees, left. Right, Devin, Darren, Maximo and Joaquin show off the results of their project. 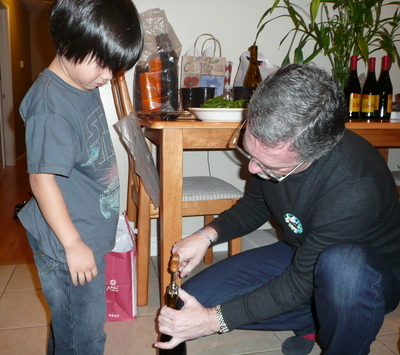 Uncle Albert shows Maximo how to uncork a bottle of wine.